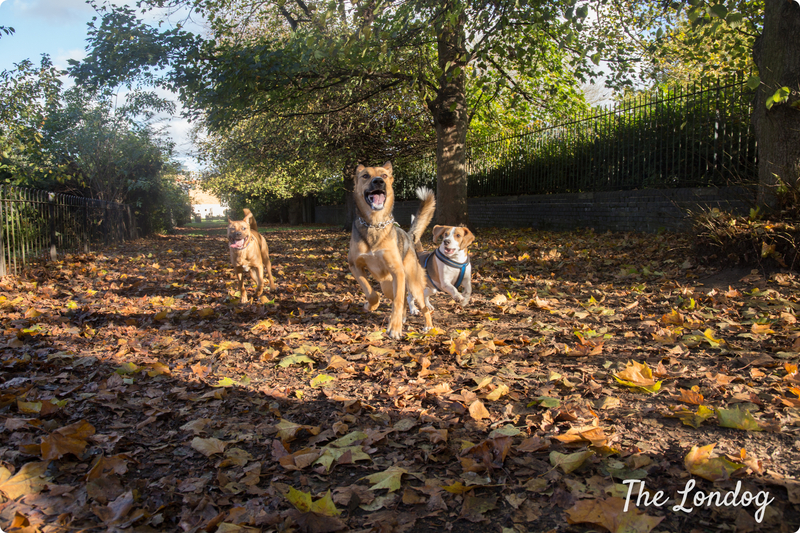 Last weekend was entirely dedicated to our London dog areas project. 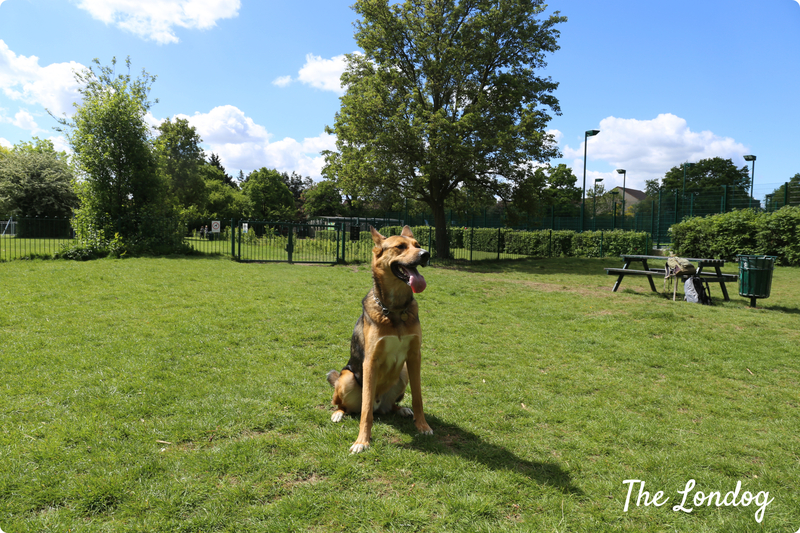 Argo, my husband and I went and visited 12 enclosed dog areas around London (6 in South London and 6 in the North and North East) in order to test them, take measures and photos of each. About 14.5 hours over two days, 39 km (24.2 miles) walked and many trains and buses later, with the tireless help of the official dog park tester, we collected much information to share with you. You can also check out more dog areas in North East London in this guide. 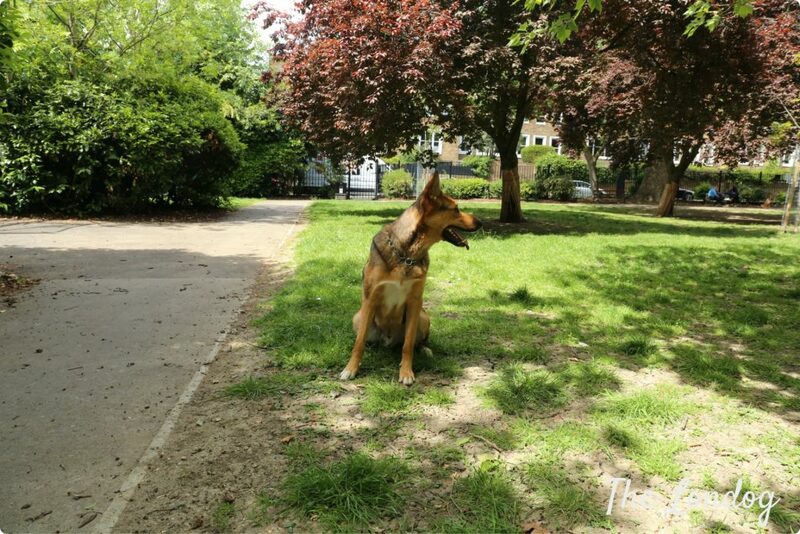 In the Borough of Camden there are currently four enclosed dog exercise areas: in Camden Square Gardens (Camden), Judd Street Open Space (St. Pancras), Kilburn Grange Park (West Hampstead) and Purchese Open Street Space (King’s Cross). There is also a dog park at Clarence Gardens. 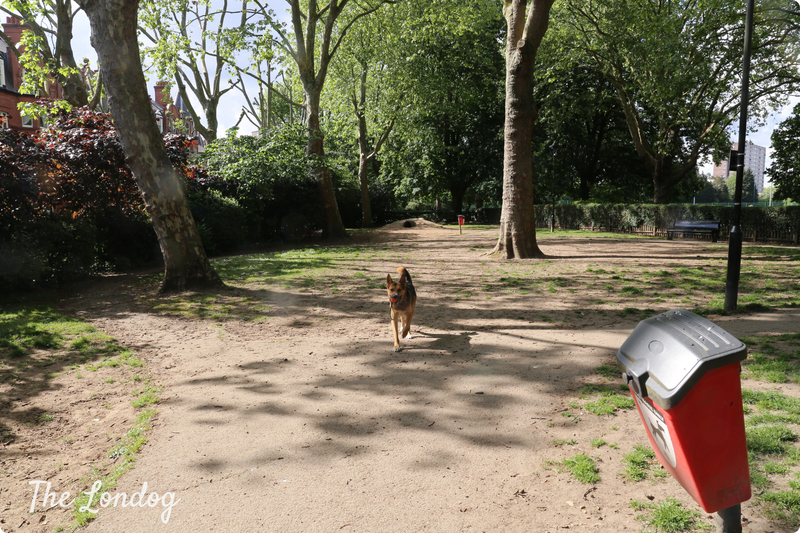 I visited the latter three earlier last year – so please bear with me if the photos of the other dog areas are not great: at the time the dog area review project was not as developed yet -, while we enjoyed Camden Square Gardens last weekend. Cantelowes Gardens. 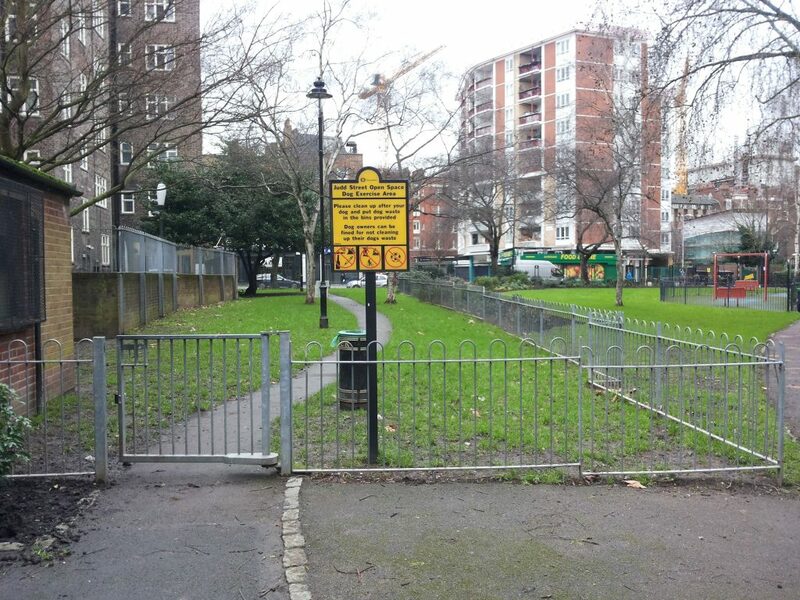 Until recently, there used to be one more dog park located in Cantelowes Gardens. 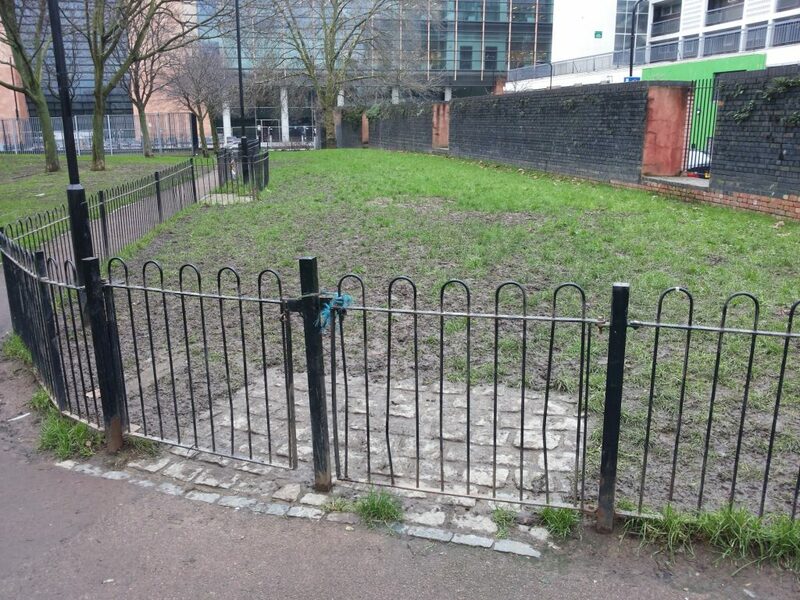 Unfortunately, during the refurbishment of the Gardens it appears that the dog area was removed. I was aware that discussions about the future of the area were ongoing, but it was only this weekend, when I visited the Gardens to take some better photos of the dog area (which I had earlier visited), that I found that the dog area was no longer there. Apparently there had been complaints about the negative impact of anti-social behaviour and noises on neibouring properties. 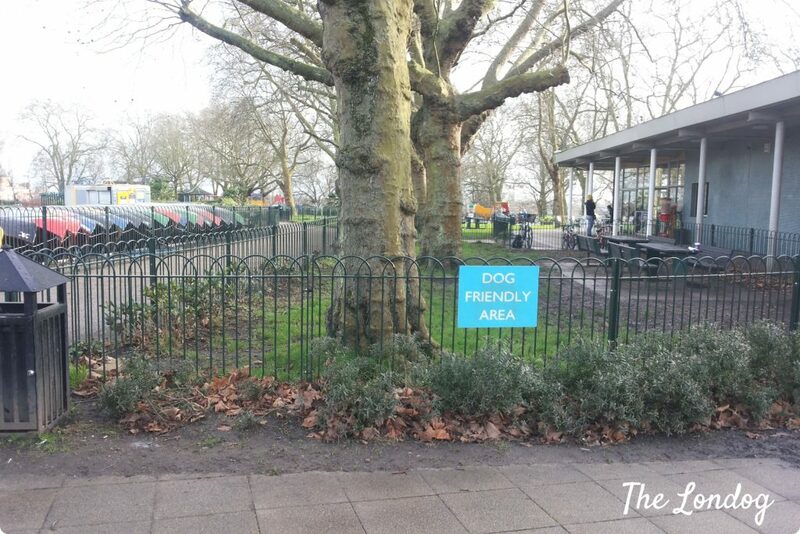 UPDATE: a kind reader told us that the dog area has been moved to another part of the gardens. We will visit later. In addition, there was previously another dog park in Talacre Gardens. 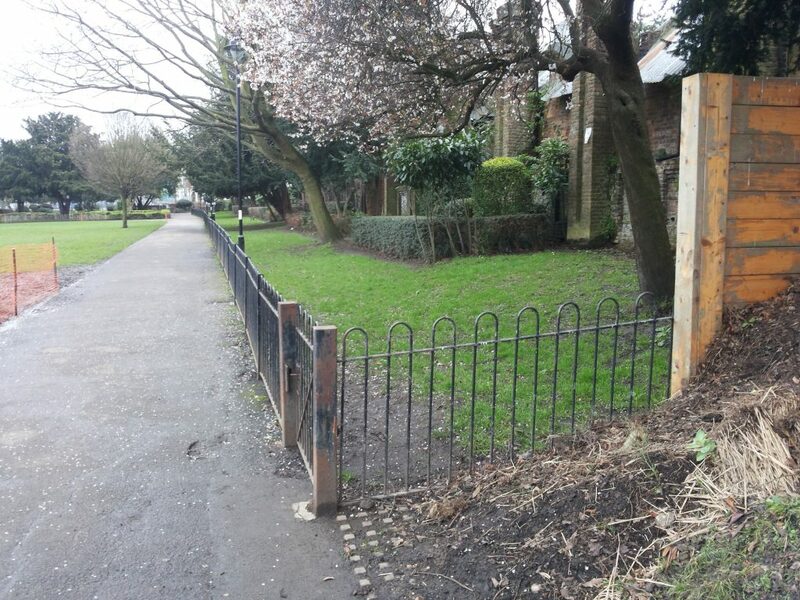 The Council confirmed that, following a request from the Friends of the Garden’s group, the dog area was absorbed into the wider park. Camden Square Gardens are located in Camden Square and the closest station is Camden Road overground station. 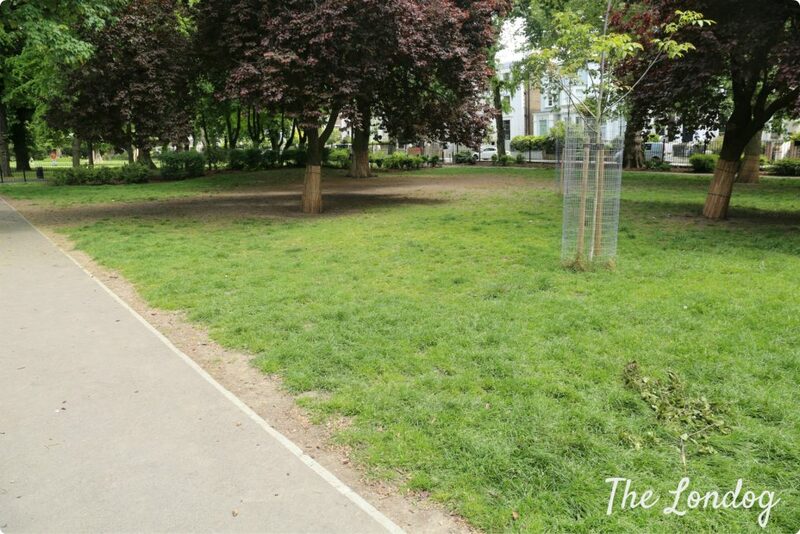 While dogs are not allowed in the main Gardens, there is a large dedicated dog exercise area in the south part of the park, with two accesses from two sides of Camden Square. 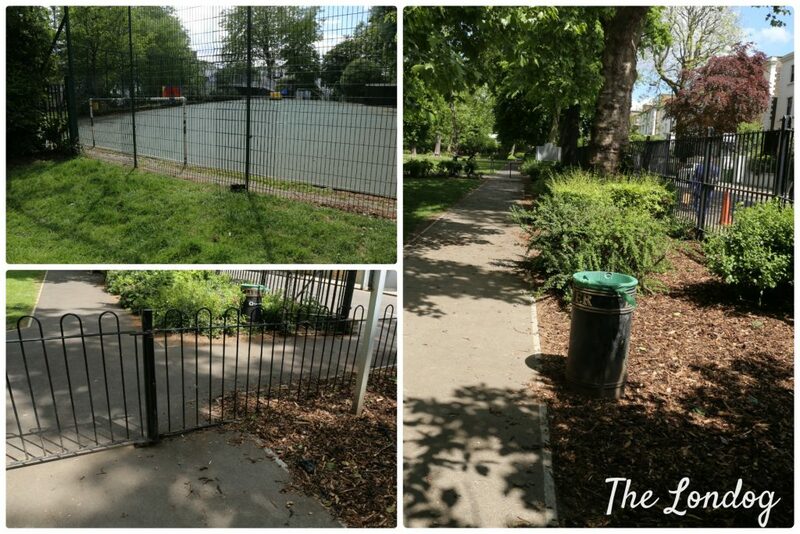 The dog area is fully enclosed by a metal bar fence and has an almost square shape. The Council confirmed that the dog park measures 1,811 square meters (approx. 19,493 square feet), which is a very good size and allows plenty of runs and playing. The area has two benches and two waste bins. Two sides of the dog area look over the Square, while the South side borders with a children playground and the North side edge looks over the main Gardens. The fence on the edge with the street is 170 cm high (66.93 inches), with space between bars of 12 cm (approx. 4.72 inches). Under the gate there is a space of around 7 cm (approx. 2.75 inches). A high and tight green metal fence divides it from the children area. There are two gates on the road, both in use and which locks work fine. A low metal bars fence divides the dog park from the main Gardens. Such fence is approximately 86 cm high (approx. 33.85 inches), with space between bars measuring 10 cm (approx. 3.93 inches). It has three gates, one of which is locked, while the other two do not have locks and one of which tends to open. I personally find that the fence with the main Gardens is too low for a large dog. You can encounter children playing football and if you have a dog that loves balls I reckon it would very easy for it to jump over the fence and run in the Gardens. Another thing to consider is that other entrances to the Gardens are located very close to the low fence dividing the dog area from the rest of the park. Therefore I would recommend some extra caution if your dog is keen on jumping over fences. From the entrance of the dog area from the street there is not a perfect visual over the three gates with the rest of the gardens, therefore it may be a good practice to have a walk and check that all gates are closed before letting your dog off lead. When we visited the Gardens, for example, one of the gates was completely open and we couldn’t see it from the entrance. The area is well maintained. At the time of our visit we didn’t see any rubbish nor dog mess around. Judd Street Open Space is located on Judd Street, just a few minutes walk South from the British Library and the Reinassance Hotel (official webpage of the area on Camden Cindex). The nearest tube station is King’s Cross St Pancras. We visited it last year and found that the Open Space hosts a playground, a green area and a dog exercise area. I would classify the dog area as small/medium sized; according to the Council it measures approximately 690 square meters (approx. 7,427 square feet). As you can see from the pictures, the area develops in lenght and has some trees, grass and some muddy areas. A metal bars fence which is 1 meter high (around 39.3 inches) encloses the area from the rest of the Open Space, while there is a higher fence on the edge with the street, which also has a stock fence in the lower part in order to prevent small dogs slipping through. Finally there is a brick wall on the border with the residential area. There are two gates on opposite parts of the dog area, which locks at the time of our visit were not working perfectly and there is some space under the gates. Unfortunately I had not started to measure and record this measures at the time, so I cannot provide such data. In terms of manteinance, at the time of our visit we found some pieces of rubbish here and there and a few muddy parts under the trees, although it was not too bad overall. Kilburn Grange Park is located just off Kilburn High Road and the nearest tube station is West Hampstead. The dog area is located in the South West part of the park, near the entrance from Grangeway and develops in lenght, as you can see from the pictures. According to the Council, I have been in contact with, the dog area measures 823 square meters (approx. 8,858 square feet). Although this is a good size, having some trees with low branches, does not make it the ideal place for playing ball fetch. The fence with the rest of the park is 90 cm high (35.4 inches), which is very low for a large dog, that could easily jump over. On the contrary, the fence and the brick walls on the edge with the residential area are high and safe. Purchese Street Open Space is located on Purchese Street and Brill Place, just a few minutes walk from St Pancras station (its official webpage is available here). It hosts an enclosed dog area which, according to the information the Council has provided me with, measures 400 square meters (approx. 4,305 square feet). Purchese Open Street Space’s dog area is definitely one of the worst Argo and I have ever visited: when we went there last year we found it badly maintained, dirty and unsafe. 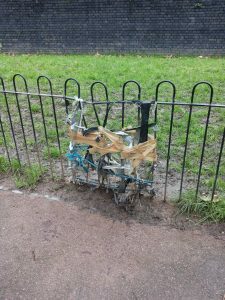 The metal bar fence on the side of the Open Space, which is 1 meter high (around 39.3 inches), had some broken parts, one of which was tighten with rope and tape. The two gates were also not working properly and one had been fixed with a rope. In addition, in the dog area we found broken glasses, beer cans, other rubbish and a lot of unpicked dog mess (unfortunately you can’t see it in the photos). At the time of our visit the dog area was quite muddy. The edge with the street is enclosed by a high brick walls and fence. 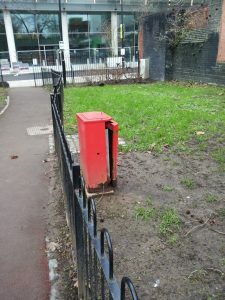 Apparently the contractor for the mainteinance of Camden’s grounds has recently changed, so maybe there is hope that they will do a better job. 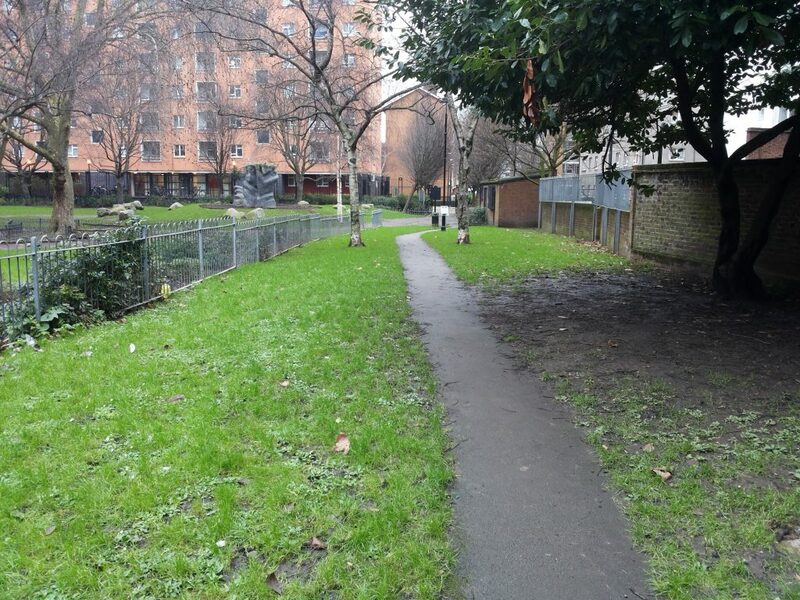 Clarence Gardens dog area is a large lawn surrounded by Council houses not far from Great Portland Street. A tiny “dog-friendly area” with picnic tables is located next to the cafe and toilets. Not really great. In addition, there is a concrete fenced part where Alpha Dog Training takes place, but I wouldn’t consider it a dog park. 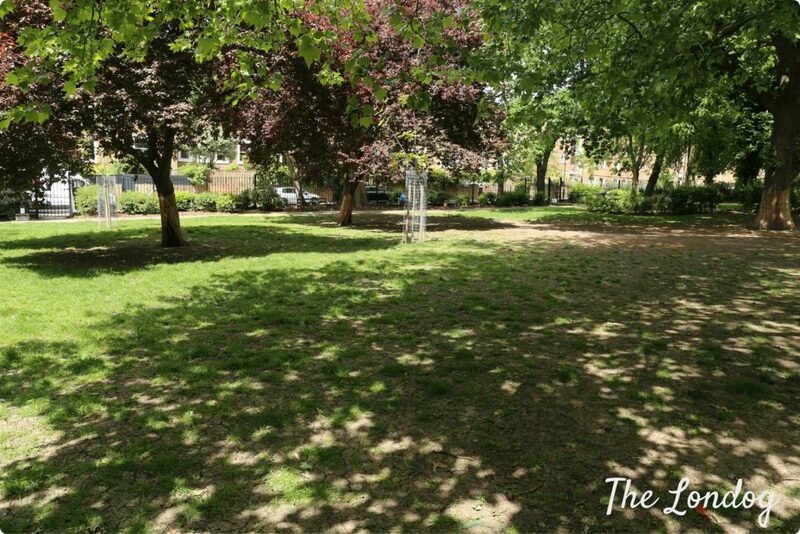 You can find a MAP of all London enclosed dog parks and further reviews in the hub linked below. Hello! a very informative page- thank you. I have a 2 yr old Husky.We discovered Tiverton Green near Queens Park NW6. The park has four gates with a path all around the green. It is a friendly park and kept clean with trees and benches with picnic areas for the Summer. There is a children’s play area at the bottom of the green which is gated. I recommend this park to anyone with small or large dogs. My Husky has adapted very well and is happy to play with others. you may also like to checkout our page on face book Pet Chat. Many thanks for your comment! Tiverton Green is on our to visit list, will add it when we get the chance to go there and write the review. Tiverton can be ok but we have encountered some aggressive dogs & even more aggressive owners! It’s a big enough space but there is not of interest for digs to do there. There’s also no water taps available on warm days. It’s open 24 hrs but is not lit so can be uncomfortable at night if own your own. 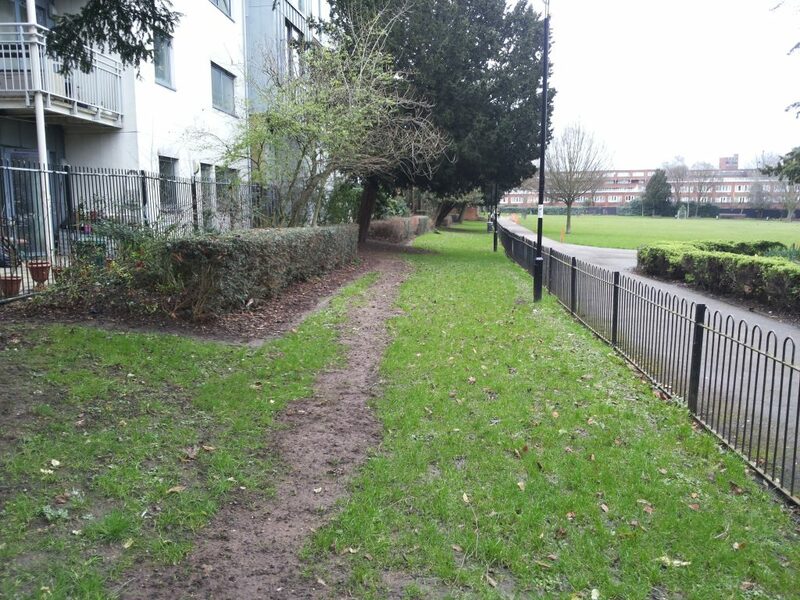 People use it as a short cut too and often don’t close the gates & can get verbally aggressive when asked to do so! We’ve had both good and bad experiences there so while not my first choice of off lead park in the area, it is useful when other parks are shut. thank you for your feedback. Being such a large green it is indeed difficult to keep an eye on entrance gates and there can be a number of issues as you highlight. The time we visited we were with another dog friend, so it was easy to stay and play together, but of course there can be other dog encounters not as pleasant. 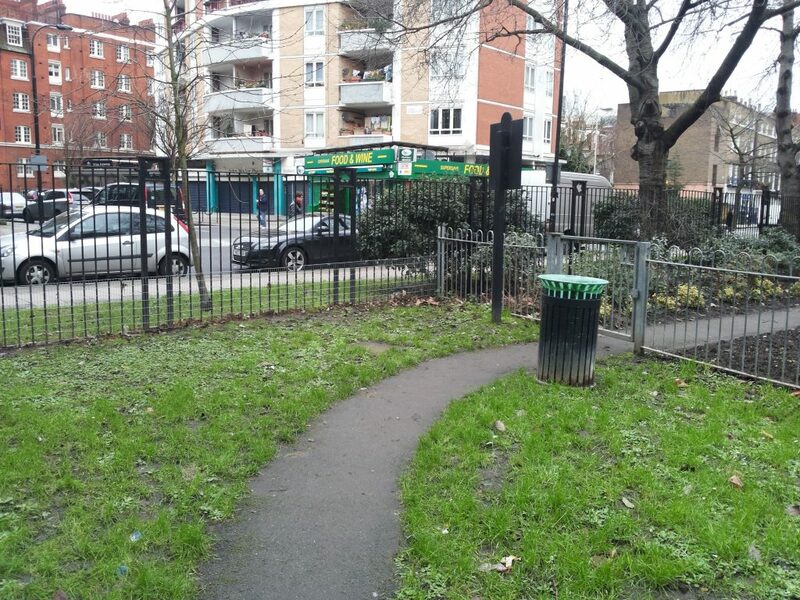 The doggy exercise area at Cantelowes Gardens has just been moved from from one side of the park to the other so it is away from the residential properties that are nearby to the previous location. It has a few big trees and some bushes to play about in, there are a couple of waste bins and two gates. My dog is tiny and yesterday an even smaller dog taught her how to get out by squeezing into the gap under the gate (about 4 inches!). I will contact the local council to ask if they could do something about the gap (my puppy dog luckily doesn’t really ‘need’ an enclosed area and usually we go to the area outside it anyway, but when there are a lot of school children about it can be useful as my puppy is rather “curious” and “confident” bless her). Thank you very much for the update on Cantelowes Garden, it is very much appreciated! I will add a note about it to the blog post (a well as community updates section and London Enclosed Dog Parks Facebook Group). I really need to visit some time again. Who knows that we may run into each other then.